Please note that the registration for the Social Event is closed and it is no longer possible to sign up for the Social Event. We ask for your understanding. One of the highlights of this year's European Planetary Science Congress will be a cruise down the River Thames on the M.V. "Dixie Queen". This luxury replica paddle steamer can comfortably take over 300 guests, and the trip will be sponsored by Astrium UK. 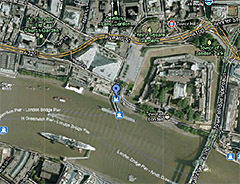 The cruise departs at 7:30pm PROMPT from Tower Pier, on the bank of the Tower of London, and will last for four hours. You need to be at Tower Pier by 7:15pm to ensure an on-time departure. 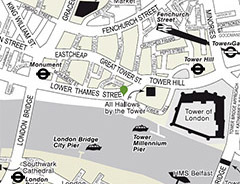 The easiest way to get to Tower Pier from University College London is to take the Circle Line underground line from Euston Square (entrance at the north end of Gower Street) to Tower Hill, and then to walk to the pier. Please allow ~1 hour to complete this journey. On board, you will get a buffet dinner and be entertained by a jazz band. 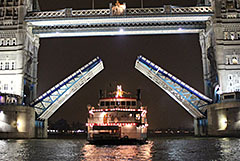 Tower Bridge, the Thames' most iconic feature, will be opened to allow the boat down and back up the River.